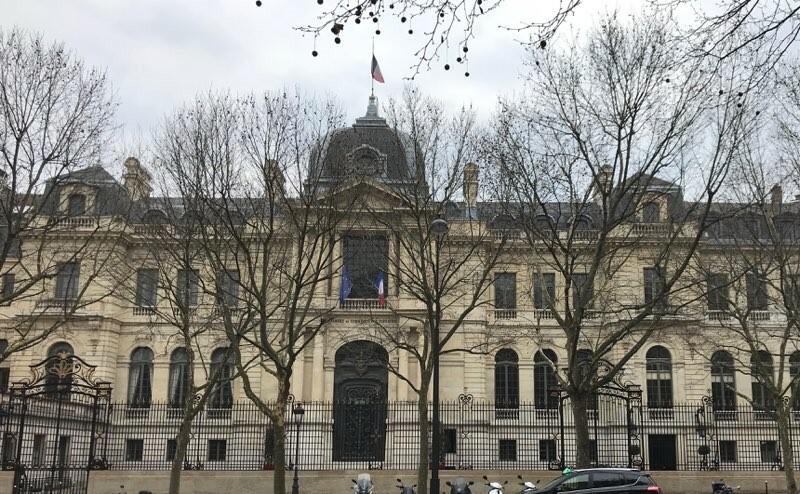 I was kindly invited to be a featured speaker at the 11th Financial Risks International Forum held at the Chambre de Commerce in Paris on March 26 & 27, 2018 located near the Arc de Triomphe. The forum brought together academics, professionals and regulators. The aim of this year’s forum was to explore emerging extra-financial risks such as climate risks, demographic risks and cyber risks, have emerged and require new tools and methodologies to evaluate them. The event was hosted by the Institut Louis Bachelier, in cooperation with the Fondation du Risque, and the Europlace Institute of Finance. I was invited based on research that I have undertaken with William “Buz” Brock related to climate change, uncertainty and economic analysis. In our current collaboration, we have brought aboard Mike Barnett, a Ph.D. student in the joint program in Economics and Finance at the University of Chicago. Two aspects of this conference drew my attention in advance of my talk. First my research features a broader notion of uncertainty that pushes beyond the usual risk modeling and measurement commonly used in economic and financial analysis. Indeed the term “risk” was prominent in the official aims of the conference. Second, Louis Bachelier, the namesake of a hosting Institute, did fundamental research on the mathematical underpinning of models of efficient financial markets and Brownian motion well ahead of his time. While Bachelier’s Ph.D thesis entitled Théorie de la Spéculation was completed in 1900, this work was unknown to economists for quite some time. Apparently it was the truly prominent (University of Chicago) statistician “Jimmie” Savage who brought it to the attention of the truly prominent economist (an alumnus of the University of Chicago undergraduate college) Paul Samuelson in the early 1950’s. Samuelson then featured Bachelier’s work in his own important contribution to the theory of efficient markets. While much recent research in macro asset pricing has featured the pricing implications of “long-run risk,” the “risk” components pertaining to economic growth can be notoriously hard to quantify. For this reason, I find it better to conceive of these in terms of broader notions of uncertainty while acknowledging the difficulties in measuring them and the resulting ambiguities. Climate uncertainty is potential important example of such a long-run uncertainty. Climate change induced by human economic activity could unfold over multiple decades and even longer and could push the environment and the economy into places not well captured by historical evidence. Meaningful climate policy therefore has to go beyond purely evidence-based approaches often advocated for micro policy analysis. Formal modeling and consequent model uncertainty is central to understanding the nature of this uncertainty. Some climate science experts provide insightful and tractable characterizations of divergent predictions across models of the climate system and delineate the difficulties in calibrating “climate sensitivity” based on recent historical evidence. In fact, dynamic macroeconomic policy assessment can seldom, if ever, be purely evidence based; but climate economics is a dramatic example of how model ambiguity can come into play. An important challenge going forward is to bring to bear concrete and meaningful assessments of climate model ambiguity into economic analysis. My co-authors and I are looking to existing climate science research along with inputs from some of my University of Chicago colleagues with expertise in climate dynamics and statistics for assistance in the challenging task. Measurement efforts within the economics community have targeted damages, which is also a key input into the analysis along with the climate science characterizations of the dynamic transmission mechanism for human imprints on the environment. Asset pricing tools are a valuable tool of policy analysis in the presence of uncertainty. The economics community has treated uncertainty within the realm of climate change in ways that are times convoluted and confusing. Asset pricing places uncertainty at the forefront in meaningful ways. An asset pricing perspective, including that associated with Bachelier, is typically used in applications to provide portfolio advice or to offer an enhanced understanding of how financial markets price exposure to macroeconomic uncertainty. The so called “social cost of carbon,” conceived of as a so-called Pivouvian tax on an externality with bad social consequences, in this case a tax on carbon emission, can be represented as an asset price. This opens the door to a meaningful incorporation of uncertainty into this cost measure. Moreover, the tools of asset pricing provide coherent ways to conduct local policy analyses (analyses of small changes) in tractable ways and shed light on the impact of more discrete alterations in policy. Thus my interest in asset pricing tools goes well beyond motivations given by people who teach investment classes. Uncertainty in the policy realm is often naively associated with inaction or denial. My co-authors and I find it fruitful to exploit modern decision theory under uncertainty in formal ways to frame climate policy challenges. It has long been evident from decision theory that action does not necessary require precise knowledge (of course such knowledge would be desirable). The possibility of bad environmental outcomes can suffice to justify immediate policy responses. For a dramatic but truly extreme illustration of this one need only to reconsider Pascal’s famous wager posed in the seventeenth century. Pascal argues that people should act as if God exists. Why? He supposes an extreme cost (actually infinite) to behaving otherwise should God actually exist and modest cost to behaving as if God exists when indeed he does not. The special cost specification makes this example extreme, but such an illustration reminds us that we should care about more than just probabilities when making decisions.